Do you need advice on the tips and cycling rules of The Netherlands? Don’t look any further. I, a Dutch local, will help you out for a safe rexperience. Cycling in The Netherlands as a foreigner is an experience. There are cycling rules that you aren’t used to. 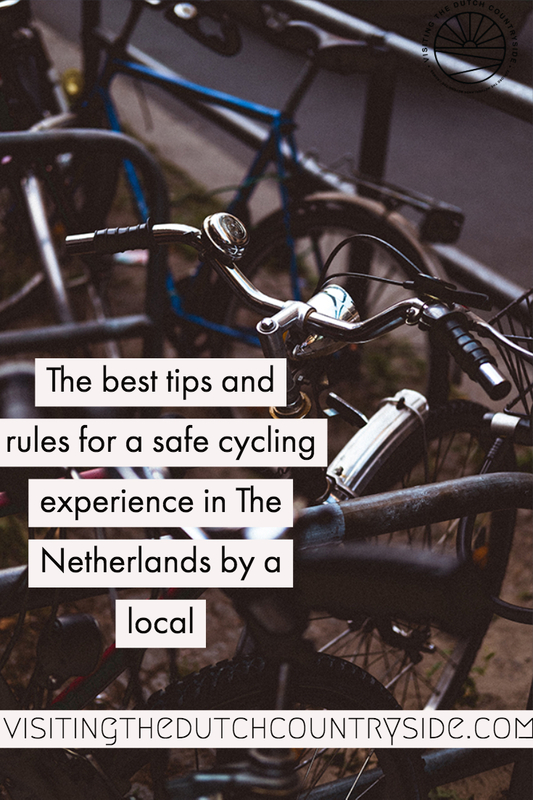 That’s why I will give you the tips and rules you need to know for a safe cycling experience in The Netherlands. Besides that, you will finally find out why cycling is so popular in The Netherlands and when it started to become popular. 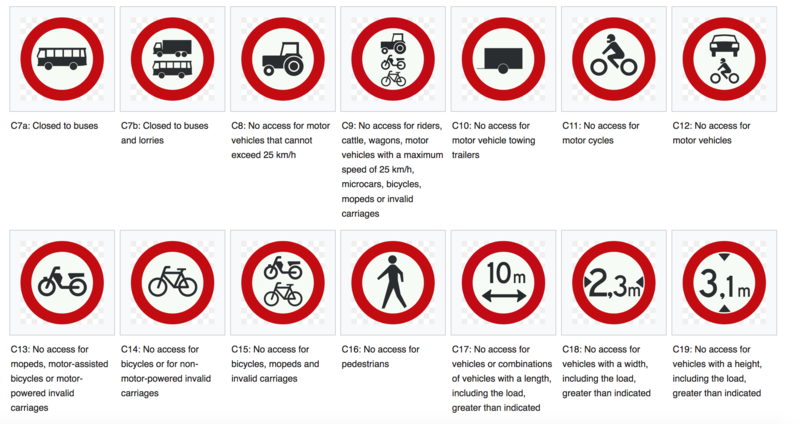 Also the cycling rules in The Netherlands and you will learn some important traffic signs. You are also about to find out why we wear no helmets when cycling and how not to piss locals off when you are trying to cycle in The Netherlands. You’ll be thankful for this article, trust me. First up is to understand why cycling is so popular in The Netherlands and why everyone can cycle so good. Cycling in The Netherlands is like nothing else in the world. I first started to learn how to cycle at the age of three or four. This might sound insane to you if you’re not Dutch. Riding a Dutch bike is very important to learn, as important as learning how to walk and swim. We learn cycling from a young age, thus we learn the cycling rules of The Netherlands straight away as well. You will see us cycling to primary schools in small groups, often without parents. And, without wearing helmets of course. I will talk about that later. When we are in primary school there is a traffic exam (verkeersexamen) every child needs to take and pass to get a traffic diploma (verkeersdiploma). We will learn the most important cycling rules and tips for cycling in The Netherlands. As you will learn in this article as well. As most of you probably know, The Netherlands is a flat country and original a delta. And very densely populated. That means many people can get to work, family, school, the supermarket and friends with a half an hour bike ride. 26 percent of The Netherlands is located below sea-level, this means that at least 26 percent of the country is completely flat. Also, half of The Netherlands is located in vulnerable areas as this country is a delta. Thus, that half of my country is also flat. Only when you head to the more Southern provinces as Limburg and Gelderland you will find some hills (highest is 300 metres in Limburg and we actually call it a mountain… Don’t ask.). Besides being a flat country, we have a great network of bicycle paths. There are other reasons as well, cars are expensive and so is the fuel. The parking fees in big cities make my great-grandfather and mother turn in their graves. And not because it is cheap. If you are thinking of driving your car through the city centre from, for instance, Amsterdam, you will hate yourself. Many cities have been built hundreds and hundreds of years ago, so designed for horse-drawn carts and not big trucks. This also means that bikes will get you faster on the other side of town than a car. Another reason that cycling is so popular in The Netherlands is that the governments discourage car use and encourage the use of bicycles. The reason? No, not for the environment (although that is a very good reason to). It also has economic reasons. This way the highways and other roads stay accessible for business and logistics. Besides that, they don’t have to spend money on expanding the road capacity and don’t have to repair the roads as often. But was cycling always that popular then did cycling become popular not that long ago in the Netherlands? Great question. Cycling hasn’t been popular in The Netherlands for centuries as you might think when you take a look at our cycle infrastructure. Cycling became popular in the late 1960s and beginning of 1970s. Because of the so-called Marshall plan from the United States, where they gave aid to a lot of countries in Europe after the devastation by the second world war, the tendency was to ‘Americanize’ the infrastructure. So, they did and started in 1948, not too long after the war finished. They did this while preserving the old European Architectures. Americanizing the cities meant that roads got wider, tram lines were removed, and people were encouraged to buy more cars. When the economy started to thrive again, people became quite wealthy and that meant that the number of cars on the roads increased. Thus, the Dutch traffic rules changed, so did the driving rules in The Netherlands. While more room for cars was created, that also meant that my country needed to demolish buildings. Main city squares were turned into car parks and the cycling infrastructure of The Netherlands ended up being destroyed together with the bicycle culture. City squares as parking lots? That isn’t something you would see right now, luckily. But can you imagine how different The Netherlands would be if we wouldn’t have made a drastic change in the 1970s? With more cars, there was a problem arising. The roads were all built to accommodate transportation with motorized vehicles, not to accommodate cyclists. But there were still people cycling in Amsterdam and the rest of The Netherlands. This meant that the number of cyclists killed in accidents with motorized traffic was enormous. Adults, children, babies. That’s the beginning of the return of the cycling infrastructure in The Netherlands. Dutch people started to protest against the murder of children and to save foot and bike paths. If you think our government listened straight away, then you are seriously wrong. The government heard the pleas of the protesters but didn’t do anything until the World Oil Crisis of 1973. Saudi Arabia blocked the export of oil to Western countries who supported Israel in the Yom Kippur War. No oil meant no fuel. Cars became a less reliable form of transport. To not get into a big economic crisis the Dutch government started a campaign to use less energy but still get economic growth. As you probably have guessed by now, cycling fitted perfectly in that picture. At first ‘autovrijezondagen’ (car-free Sundays) were introduced. That’s when everyone all a sudden became aware of how cities are supposed to look like, and what they looked like before the invasion of cars and big roads. So, at first, the city and town centres were made into car-free zones, permanently. So, the start of the bicycle culture in The Netherlands was upon us. Yet, the fight continued. Because while the city centres were made into car-free zones, bike paths were nowhere to be found in The Netherlands. Finally, the government listened. The first cycle routes (separated from motorized traffic) were created in Den Haag (The Hague) and Tilburg. In both cities, the traffic from cyclists increased by over 60 percent. That incredible increase of usage of the bike lanes meant that the people of The Netherlands was adapting to cyclists with the use of bike paths, and nowadays there is even a bicycle highway. But the best of all? The Netherlands is one of the most bicycle-friendly countries of the world and I couldn’t be happier about it. Cycling is in our blood. In our DNA. In our identity. 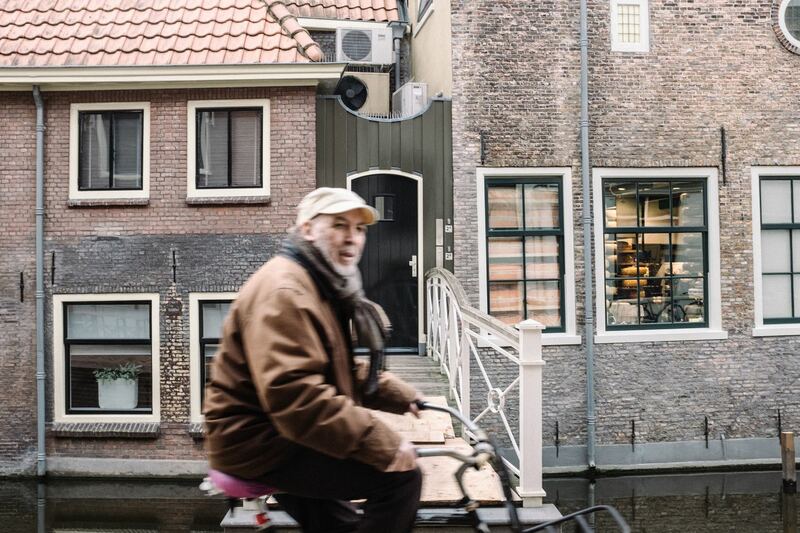 While cycling is in the DNA of the Dutch people, including in mine, it often isn’t in the DNA of visitors or expats. That’s why I will also tell you the most important cycling rule in The Netherlands for a safe cycling experience and the biking traffic rules of The Netherlands that you should remember. You should definitely remember these tips for cycling in The Netherlands. First of all. If you do not know how to cycle, please, do not even think about starting your cycling lessons in Amsterdam or in any of the big cities or towns. Go to a small town or village where there isn’t a lot of traffic. I know it sounds fun. Cycling in Amsterdam and the rest of The Netherlands, along a cycling route together with cyclists from The Netherlands. Riding through big cities, together with hundreds of other cyclists. But it is hectic and there are bike riding rules that you should follow. 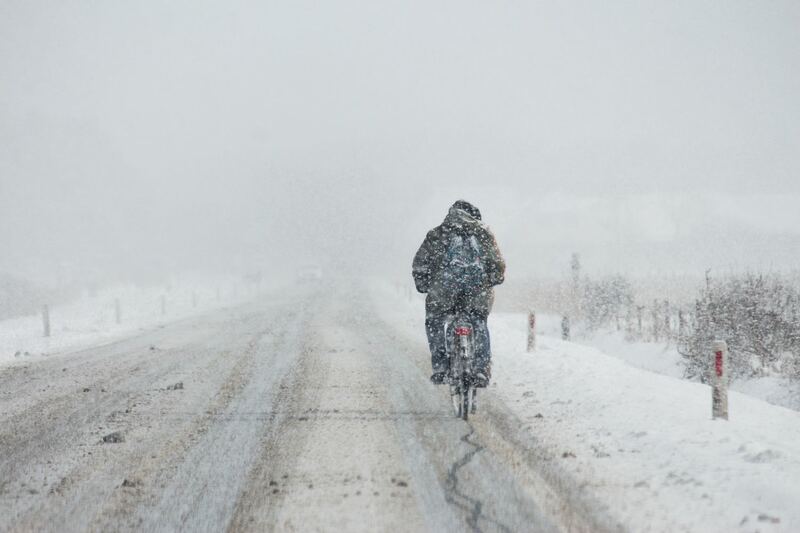 Second, if you think you are a good cyclist but have never cycled in The Netherlands before, don’t assume you are a good cyclist. Because you probably aren’t. You are not used to the crowds, the roads, the other modes of transportation and the signs. No offense (in case you are not used to our Dutch directness), but cycling is our main way of transport in the big cities. And, bikes in The Netherlands are different than in most other countries. Third, don’t try to follow us, Dutchies, on our bikes. That is one of the most important tips for cycling in The Netherlands. If we run a red light, that means we know the system of the traffic light inside out. If you follow that can mean that you will get into an accident, but that could also mean that you get a fine for running the red light. Don’t worry, Dutch people get those too, but are willing to take the risk. Another example, if we use our phone on our bike while holding two bags filled with groceries and having one person on the back of our bike, that doesn’t mean you should try that. We know what we can do and what we cannot do. Don’t be an idiot. I also don’t want you to get hurt. Now, after this general talk and if you do know how to cycle plus are willing to experience our daily life, aka madness, then go ahead. I have to admit that cycling in The Netherlands is something that should be on your ‘what to do list’ of The Netherlands if you know how to cycle and look at the Dutch cycling signs. Just know that you should keep these 18 essential cycling rules in mind to survive cycling in The Netherlands. 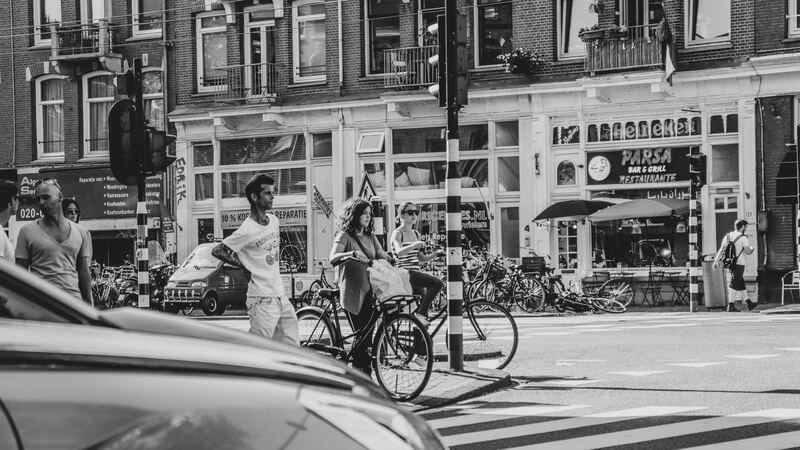 With these tips, you won’t piss locals (aka me) off when you’re cycling in Amsterdam or the rest of The Netherlands. Keep to the right side. We don’t drive on the left with our cars, so our bikes don’t do that either. Don’t be that douche. Do NEVER pause all a sudden when you are riding your bike. Always look first. It baffles me when I see how often people stop in the middle of a bike path. What were you thinking? You need to see a bike as you would see a car in, for instance, the U.S.A. Do you brake all a sudden in your car without looking? I hope the answer is no. Then, in that case, you shouldn’t do that on a bike either. Cyclists ride close together, so unless you want everyone to crash into you don’t do this. Following cycling rule number 2, don’t stop in the middle of a cycle path to check your map or phone. You will be cursed at with every disease there is out there and definitely, don’t make any local friends. Don’t cycle with two aside if there is no space to overtake for other cyclists or scooters. That’s rude. And annoying. You will see Dutch people often riding like this (guilty), but, we know how the traffic works and can move freely wherever we cycle because we can adapt quickly. Look behind you when you want to turn into another street and put out your arm and finger to the right or left so people know where you are going. It’s all about adapting and communication in our cycling world. Don’t ride in the opposite direction on a cycle path. Besides keeping yourself safe, you will also keep the pedestrians safe as some don’t check both ways. If you are cycling in the dark, in the fog or when visibility is bad to make sure you have lights that actually work. If you don’t have them, go to the Hema store, any supermarket or street market and buy one for a few euros. You need to have a red light at the back and a white or yellow in front. If you refuse to buy a light, there are big chances that the police will give you a fine and I know you would rather use that money to buy stroopwafels. You’re welcome. The lights have to shine straight ahead and flashing lights are not allowed. They also need to visible, so don’t put them somewhere that wouldn’t make sense. When you are cycling in a national park or a small village, everyone will say hello or good morning to each other. No one does this in big cities, but you will be rude to not say hello back. Cycling if you are drunk or stoned is not a good idea. Cycling after drinking alcohol is actually not allowed and police will test you if you ride like a complete fool. And those fines aren’t cheap. Ride on the bike path. There is a bike path for a reason, so don’t cycle on the sidewalk or on a pedestrian path. 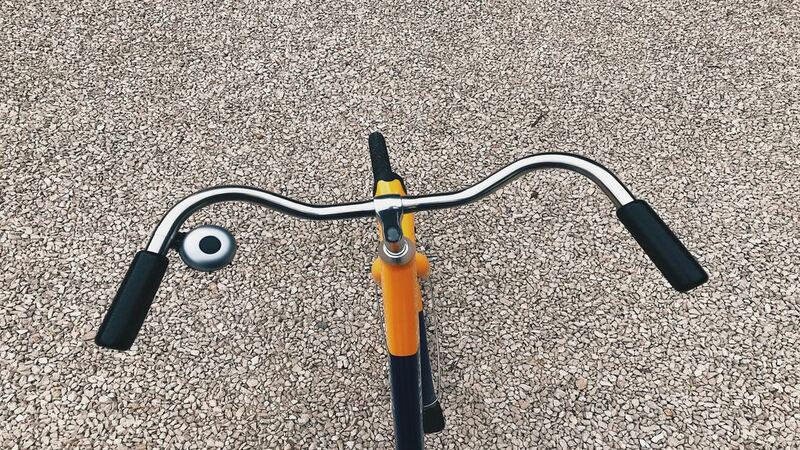 A bicycle bell makes life easier. Don’t yell if you want to pass someone but use the bell. And, most importantly, respond to someone else when they use their bell. Move aside, there is a reason they use it. Don’t start ringing your bell at random, this makes a lot of locals very annoyed because they are not used to have fun with. They are used to warn people that someone wants to overtake. If you are cycling in a city that has a tram line, such as Amsterdam, cross it diagonally. Always. Otherwise, your wheel gets stuck in one of them and you will fall as your bike simply stops. Those crashes aren’t that soft. When there are crossroads, if you have an overview of the main road, the person from the right side always goes first. Drive as much right on the cycle path as possible. Scooters drive on the cycle paths often as well and some can be a bit, well, aggressive. Just to be safe. Don’t use your phone or something else while riding your bike. There is so much stuff happening that you need to pay attention to the roads. Many Dutch bicycles have the back-pedal brakes, instead of the ones mounted on the handlebars. If you have never ridden a bike with those kinds of brakes before, practice. Practice. And practice some more, until you are comfortable using them. Haaientanden. What? The literal translation is shark teeth. When you are cycling you will see white triangles painted on the ground. If the triangle is pointing at you, you have to stop to let traffic pass. If this is not the case, you are free to go, however always be aware of your surroundings. Some people don’t follow the rules. If you spot zebra stripes, aka a pedestrian crosswalk, you’re supposed to stop when pedestrians want to cross. Do that. Where is my helmet and where are the helmets of the Dutch people when they ride their bikes? 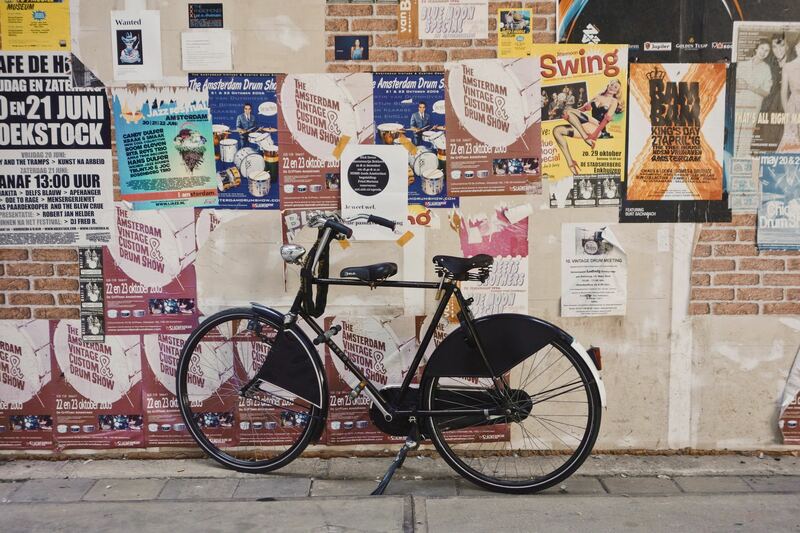 If you are renting a bike in The Netherlands, no renting shop will give or recommend you a helmet unless you are renting an atb or sports bike to work-out. If you must wear a helmet, you have to ask them, and they will charge you extra (of course). We simply don’t wear helmets unless we ride the sports bikes because of many different reasons. The first reason helmets aren’t used in The Netherlands is because the cycling speed is low and very consistent. This is because there is very limited height difference because the country is so flat. Another reason is that most people use commuter bikes and not an unstable atb or sports bike. We also think that helmets are overrated because if I fall I know that I shouldn’t fall on my head and teeth. We learn how to fall when we are kids and we get taught how to ride our bikes at such a young age that we know how to handle the bike and the traffic. Our official bicycle union is also opposed to helmets for bicyclists. And we find that helmets give a false sense of security. Motorists will show more dangerous behaviours when they see a better-protected cyclist than towards the less protected one. You also have to keep in mind that in The Netherlands we have an infrastructure that is created and well suited for cyclists. There are separate bike paths everywhere and if you get hit by a car at speed, a bicycle helmet won’t help to save your life. Another reason is that we don’t see cycling solely as a sport, it’s a way of life. We cycle everywhere. From schools to the sports club and from the club to the supermarket. Cycling is a sport when you practice it as a sport, meaning: when you’re wearing sports clothes, go fast and break a sweat. Everything besides that is just transportation on a daily basis. Nearly all motorists are cyclists too, so they know how to give you space. It is something all driving instructors teach when you do your driving lessons. So, what I, and many other Dutch people, think of wearing helmets is that it is not necessary for The Netherlands unless you are working out. I can see how not wearing a helmet is weird if you come from a country where cycling isn’t well established. That is because drivers aren’t used to driving around cyclists which make it dangerous. Why do Dutch people don’t cycle on normal bikes? These are normal bikes… You mean why don’t we ride sports bicycles? Because those are used for working out. We ride modern bicycles because cycling is a way of transportation and the main purpose of a bike is not working out. When you are in The Netherlands you notice that almost everyone has a bike that makes you sit up straight, which is good for your posture and back. Cycling on sports bicycles is not comfortable and practical for day to day life at all. We cycle to restaurants in nice clothing, to meetings, to work, to the supermarket, to the gym, to a wedding, etc. One tip for cycling in The Netherlands, to not sweat like a pig once you arrive at your destination, you want to have a basic bike that is sturdy and comfortable. We cycle through storms, with people on the back of your bike and in front, take a broken bicycle home while riding another, with three grocery bags while we are talking on our phone, etc. This can be done with normal, modern and sturdy bikes. Not work out bikes. At first, you need to remember that a diamond sign indicates a priority, red triangles are warnings and the red circles stand for restrictions. Besides that, blue circles are requirements and squares and rectangles give guidance. 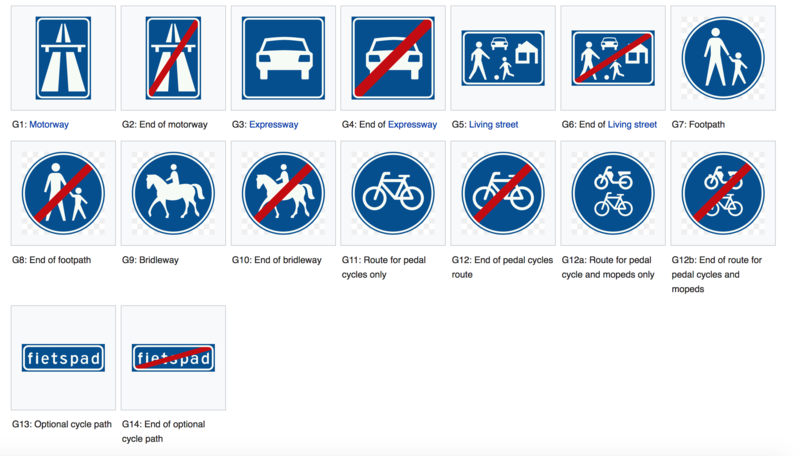 You can find some of the road traffic signs and regulations of The Netherlands on the photos below. Have you biked in The Netherlands already? Or are you planning on riding a bike in The Netherlands? Anything else that you’d add? Share this post!